The neighbourhood TriBeCa in New York can be found in Lower Manhattan. Where exactly? Well, it’s all in the name. TriBeCa is an acronym for ‘Triangle Below Canal Street’. That means TriBeCa is located between the Hudson River, Canal Street, Broadway and Vesey Street, roughly spoken. In the North-West of this area you find the entrance to the Holland Tunnel, that connects New York to New Jersey. Although TriBeCa in New York is pretty popular nowadays, it hasn’t always been. The warehouses that now have a mostly residential function, date back to a time when this neighbourhood was still an industrial area. After a period of vacancy and decay, in the 80’s a group of artists started to squat in the attics of the abandoned warehouses. That was the beginning of the neighbourhood’s revival. Companies moved there, and it took only 10 years before TriBeCa was back on the map. This time as a desirable area. TriBeCa has been voted as one of the safest areas of New York City and many movie and pop stars call the area home. Beyoncé and Jay-Z, Meryl Streep, Justin Timberlake and Leonardo DiCaprio, to name a few. TriBeCa is one of the most expensive neighbourhoods in New York. It’s no surprise that a neighbourhood with so many celebrities and expensive lofts is bursting with luxurious shops and restaurants. Takahachi, for example – a Japanese restaurant serving sushi and a la carte dishes. 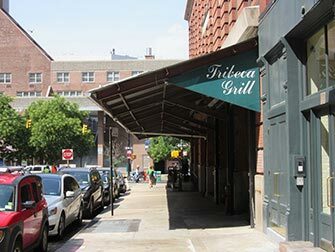 Or Tribeca Grill, which is co-owned by Robert De Niro and very popular amongst celebrities. If you would like something little low-key, you should go to the non-pretentious bar Anotheroom. Because of the setting and the lighting, it’s romantic and homey. It’s a great place for a date – especially if your partner (to be) loves speciality beers and good wine! On the TriBeCa side of the Hudson River Park you’ll find a huge playground paradise: Pier 25. This part of the park has something to offer for every age. From the children’s playground with water features to the climbing wall and the beach volleyball courts, the miniature golf course and the sun deck with luxurious lounge chairs. To shift the focus after the 9/11 attacks and support the area’s reconstruction, Robert De Niro, Jane Rosenthal and Craig Hatkoff founded the TriBeCa Film Festival. It boosted the reputation of New York as a movie town and became one of the most prominent film festivals in the world. Apart from the huge number of documentaries, shorts and family films to watch, there are also the annual Artist Award and lots of free activities. For the ultimate American vibe I would send you to the Tribeca Film Festival Drive-In at World Financial Plaza. The name ‘Drive-In’ might be a little misleading, since it’s basically an open-air screening. In other words: watching movies with a lot of people, at a small harbour by the Hudson underneath the stars. Around the screening there’s lots of family friendly activities in the theme of the movie. 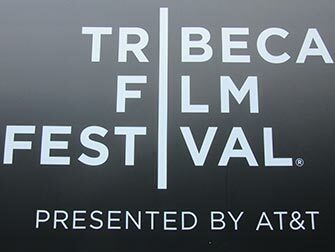 In 2019 the TriBeCa Film Festival will be from April 24th to May 5th.